The Tower of London is haunted by a multitude of ghosts. It is no surprise that the tower crawls with ghosts, since the suffering of legions waiting for death and torture occurred in this stone structure. The ground is saturated with the blood of those who practiced the wrong faith or followed the wrong kings. Lady Jane Grey is one of the many ghosts that walks the halls of The Tower of London. She is also one of the most tragic figures that wanders the tower. Lady Jane Grey was a victim of her plotting uncle. He wanted to take the throne from Mary Tudor, the daughter of Henry VIII, before Mary succeeded the throne. Lady Jane was the granddaughter of Henry VII and was thus loosely connected to the succession. Lady Jane's uncle married her to Guildford Dudley and the two claimed the throne of England. The two young people were idealists and believed they were taking the throne to save England from the Catholic leanings of Mary Tudor. Jane Grey was only 16 when she took the throne. She was deeply in love with her husband and completely unaware of weakness of her claim. She was an intellectual who loved books and a romantic who believed that she and her husband could change England for the better. She ruled for nine days before Mary Tudor claimed the throne. Jane was forced to watch her husband die before she was executed in the tower for treason. She prayed as she was taken to the slab. She was beheaded on Tower Hill on February 12, 1554. Since that time she has been seen wandering the tower on many occasions. Guildford Dudley has also been seen weeping in the tower. The best documented siting of Lady Jane occurred on February 12, 1957. A guard saw the phantom lady standing above him in the battlements. He called out to the other guard and he also saw the lonely lady walking above them in the cold night air. The Innocent often pay the price for the crimes of the ambitious..Then and now!..Cheers mate! Lady Jane's story would be a fascinating even without the paranormal connection, but set against the bloody backdrop of the Tower of London it becomes one of the great ghost stories of the western world. Love this stuff. Jeffrey... so true. I'm afraid that will always be true. Bleaux Leaux.. I read a book about her that was completely non paranormal and it was wonderful,,, but the ghost story has grown to be a classic. I love the Tower ghost stories. Such an amazing history! That is one of my favs! Poor Lady Jane! I wonder if Lady Jane's ghost is aware of her dead husband's ghost... or are they just caught up in their own individual, solitary loops of sorrow? Her story alone is intriguing but add the ghost story and it is much more. Hey Jessica I'm a new follower and I have to say I LOVE this blog. You have some great stuff here. Little Gothic Horrors.... I've often wondered the same thing. Queen for nine days ?! 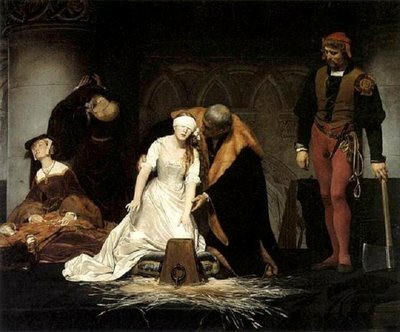 Lady Jane Grey was not a victim of her uncle. She was the victim of her husbands father, the Duke of Northumberland. Northumberland was executed for his deeds, as was her father, the Duke of Suffolk by Queen Mary I. Mary knew that Jane was innocent of high treason, but Thomas Wyatt sealed her fate when he lead the Wyatt Rebellion against Mary to restore Jane, or place Elizabeth on the throne. I was beheaded on Tower Green and not Tower Hill. A much private affair. A privilege my royal status granted me. Get it right, it's important.